This workbox was designed for Smart Technologies as a way to transport tools and peripheral equipment to build their trade show booth's. 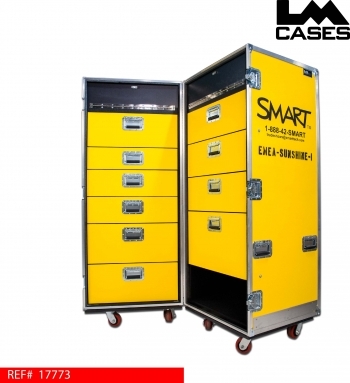 The case is intended to be a central tool box holding everything from extension cords and office supplies, to hand tools and back up system components. 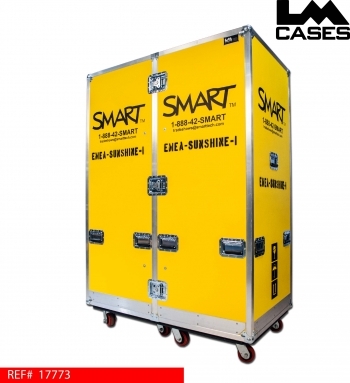 The case is built out of 1/2" plywood laminated with yellow ABS plastic, the case interior is designed in 2 independent right and left sections. All the drawers in the case are first mounted into shells, then the shell complete with drawers is mounted into the case. 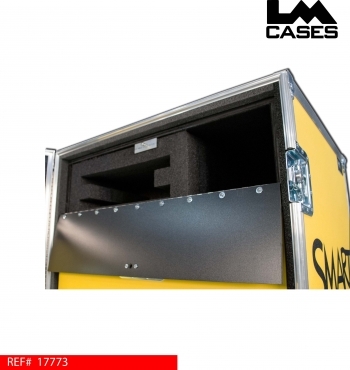 This "case within a case" method ensures maximum isolation between the drawers and the exterior case. The isolation is important due to the weight inside the drawers and the extreme abuse the exterior case will encounter; isolating the drawers from the exterior case allows only downward pressure to be applied to the drawer glides removing the lateral stress of pushing or pulling the case from the glides. The left half of the case features 6 drawers while the right half has 4 larger drawers for storage. The top of each section features custom CNC cut foam inserts to hold system control panels. The bottom of the right side of the case features an open storage compartment for boxes and other large bulky items. The exterior case feature 4" x 2" Colson casters, 1/4" aluminum forklift guard, 14 handles and custom silkscreens and stencils.